Figure 1. This suite contains more than 36 carats of Yogo sapphires. Courtesy of RareSource. Photo by Robert Weldon/GIA. Over more than 120 years, mines in Yogo Gulch, Montana, have produced millions of carats of rough sapphire. Much of that has yielded very small finished stones, and faceted stones over 1 ct are highly prized (figure 1). The largest known Yogo sapphire crystal was found in 1910 and weighed 19 ct (Howard, 1962a) The shape of Yogo rough is often in the form of flat tabular crystals that offer a very low yield. Large stones over 1 ct are almost exclusively collector stones, with the provenance having a significant impact on value. 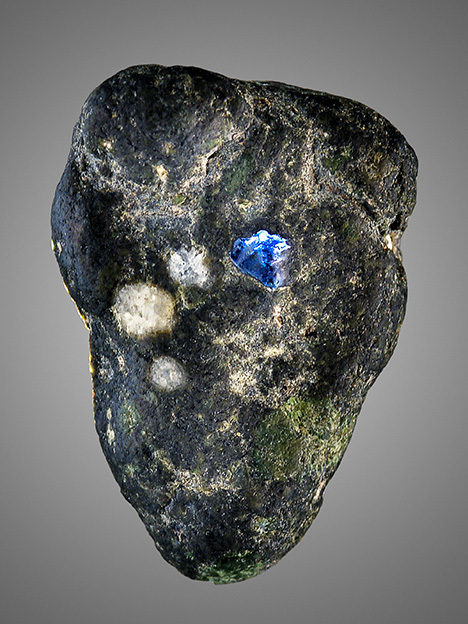 While there are other significant sources of gem-quality sapphire in Montana—including Rock Creek, Missouri River, and Dry Cottonwood Creek—Yogo sapphires are unique among these and other sapphire deposits worldwide (figure 2). 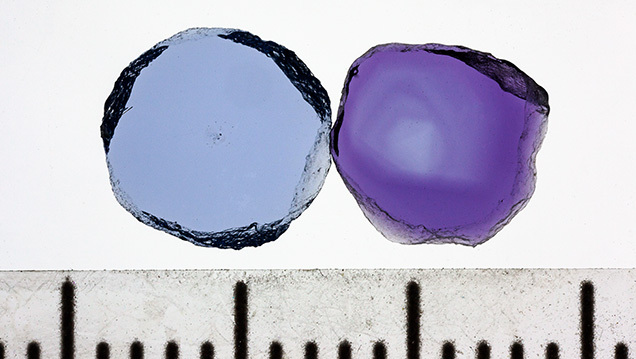 Virtually all of the material produced has a desirable even blue to violet or purple color, often with higher clarity than sapphires from other deposits (Yaras, 1969) (figure 3). Yogo sapphires do not require heat treatment, offering a virtual guarantee of their untreated nature. They also possess a unique trace-element chemistry and an inclusion suite that makes them easily recognizable to the experienced gemologist. Figure 2. The major gem sapphire deposits in the state of Montana. The sapphire deposit at Yogo Gulch is the only primary deposit in Montana. Figure 3. This suite of rough and cut Yogo sapphires shows the wide range of blue to violet or purple hues and light to dark saturation combinations that can be found in Yogo sapphires. The largest faceted stone is a 1.44 ct cushion cut. Photo by Kevin Schumacher, courtesy of Bill Vance. In 1895, the Yogo sapphire deposit was accidentally discovered by a gold prospector named Jake Hoover. Hoover sought financial backing from two friends—local banker S.S. Hobson and Dr. Jim Bouvet, a veterinarian from Chicago—and the three formed a mining partnership. While recovering gold from his sluice, Hoover found many shiny blue pebbles and sent them to Dr. George Kunz of Tiffany & Co. in New York for identification. These were confirmed to be sapphires, and a cigar box full of the blue pebbles was purchased by Tiffany for $3,750. In contrast, Hoover only recovered $700 in gold that season (approximately 35 troy ounces; Woodward and Hanley, 2013). Since the sapphires proved to be more profitable than the gold, Hoover and his partners focused their attention on mining for sapphires at Yogo Gulch. In 1896, James Ettien discovered a sapphire-bearing weathered dike (for boldfaced terms, please refer to the Glossary) and staked a mining claim on it (Howard, 1962b). This claim was purchased in late 1896 by Hoover and his associates for $2,450. In 1897, the death of Jim Bouvet brought the introduction of two new partners, Matthew Dunn and George A. Wells, and the foursome formed the New Mine Sapphire Syndicate (Voynick, 2001). Other claims in the area began to appear as news of the sapphire deposit spread. John Burke and Pat Sweeny staked a claim further west on Yogo Creek that would later be known as the American mine (Woodward and Hanley, 2013). The following year saw the arrival of a group of London gem merchants, as Johnson, Walker, and Tolhurst Ltd. acquired the majority interest in the New Mine Sapphire Syndicate. Annual production increased to more than 400,000 carats before 1900, with approximately a quarter of that production being gem quality. The remainder found a market for industrial use as abrasives or watch bearings (figure 4). By 1901, the London group had acquired the remaining share of the New Mine Sapphire Syndicate from Hoover’s partners (Woodward and Hanley, 2013). This mine at the eastern end of the deposit would become known as the English mine. Charles Gadsden (figure 5), another Englishman who would become a significant figure in Yogo’s history, arrived in 1902 and supervised the English mine until it closed in 1929. Figure 4. 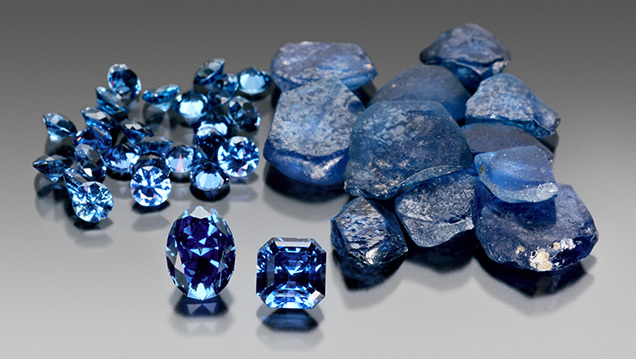 Many of the “industrial-grade” Yogo sapphires that were too thin to cut as gemstones were used for watch bearings and abrasives. 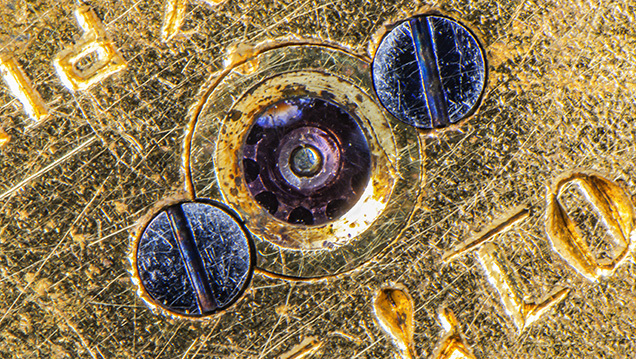 The natural sapphire bearing in this American Waltham Watch Co. movement, which measures 1.28 mm in diameter, is likely not from the Yogo deposit. Photomicrograph by Nathan Renfro. Figure 5. 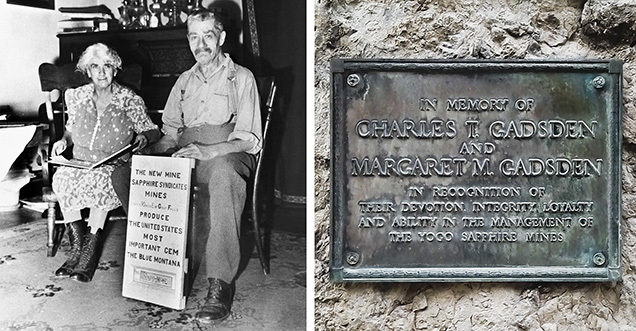 Left: Charles Gadsden and his wife Margaret managed the English mine from 1902 until its closure in 1929. Photo courtesy of Stephen Droullard. Right: A plaque installed at the “tollgate” in Yogo Gulch marks the Gadsdens’ significance in the history of the Yogo deposit. Photo by Nathan Renfro. Mining claims on the western end of the dike that were staked by Burke and Sweeny were purchased by the American Sapphire Company of New York, which began operations in 1905. This became known as the American mine (figure 6). Within a few years, the company reorganized as the Yogo American Sapphire Company and was ultimately acquired by the New Mine Sapphire Syndicate in 1914 at Gadsden’s recommendation. Even though the mine was not reopened at that time, Gadsden rewashed the dump piles from the American mine, recovering most of the purchase price of $80,000 (Howard, 1962b). Figure 6. The Yogo dike system. The thick line demarcates the Yogo dike. Geological formations shown on the map are the Mississippian-age Madison Formation (Mm), the Kibbey Formation (Mk), and the Otter Formation (Mo), all belonging to the Madison Group. Modified from Dahy (1991) and Mychaluk (1995). World War I would halt the production of Yogo sapphires, as miners were needed to extract metals to support the war effort. By 1921, activity at Yogo had returned to pre-war levels, but this early productive period in Yogo sapphire mining was about to end. After a flood in 1923 destroyed much of the English mine operation’s infrastructure, production declined significantly. This natural disaster and competition from synthetic sapphires were devastating for sapphire mining at Yogo Gulch. In 1927, the last year of production from this era, the deposit yielded a reported $4,850 of sapphire (Woodward and Hanley, 2013). The English mine had a successful and profitable run and even uncovered a 19 ct rough stone, still the largest Yogo sapphire ever recorded. That stone was cut into four gems, the largest of which weighed 8.5 ct (Howard, 1962a). Nevertheless, the mine was officially closed in 1929 (Howard, 1962b). The New Mine Sapphire Syndicate struggled to find a buyer for a number of years, but in 1949 a group of investors led by Thomas P. Sidwell began lengthy negotiations to purchase the mine. This group formed the Yogo Sapphire Mining Corporation (which was eventually reorganized in 1956, once again as the New Mine Sapphire Syndicate) and purchased the mine for $65,000. After somewhat unsuccessful attempts at mining and with financial and legal problems mounting, the mine was purchased in 1965 by Siskon Inc., a Nevada-based construction firm, for $75,000. Siskon then leased the property to Arnold Baron, who had some success cutting and selling sapphires but ran into problems mining the dike, which turned out to be more complex than previously thought (Voynick, 2001). After two years, when Baron decided that the mining cost was prohibitive and chose not to purchase the property, Siskon put it up for sale. The property was reportedly purchased for $585,000 (Voynick, 2001) by a group of Californians including Herman Yaras and Ray Von Felden, who formed Sapphire Village Inc. This deal was comprised of 1,780 acres along the sapphire-bearing dike and included the old British and American mines and the surrounding land (Leiper, 1969). In addition to developing the mine, the new owners created Sapphire Village, in which a portion of the property was subdivided into small lots, up to one-third of an acre in size, that had rights to excavate a limited amount of rock from an area of virgin dike (Leiper, 1969). By 1973, Chikara Kunisaki formed the Sapphire International Corporation, which bought the assets of Sapphire Village Inc. and began one of the most serious mining efforts on the Yogo dike since the English mine (Voynick, 2001). At a cost of nearly $5 million, he installed a 3,000-foot tunnel in the old American mine that became known as the “Kunisaki Tunnel.” In the fall of 1976, operations at Sapphire International ceased with another failed attempt at profitably mining Yogo sapphires. In 1977, another player entered the Yogo sapphire game. Victor di Suvero leased the Kunisaki property under the name Sapphire-Yogo Mines, Inc. Di Suvero also started a marketing and distribution company, Sapphire Trading Co., Inc., which in 1978 began what was slated to be an extensive marketing campaign aimed at bringing Yogo sapphires into the spotlight (“The $1 million sapphire campaign,” 1978). Unable to make the payments and with funding running out, Di Suvero relinquished the lease in 1979 (Voynick, 2001). The next turn in the Yogo tale saw the sale of the Kunisaki property in 1980 to mining engineer Harry Bullock for $6 million and the formation of American Yogo Sapphire, Ltd. In 1982, the company changed its name to Intergem, Ltd., and began marketing Yogo sapphires as “Royal American Sapphires,” guaranteeing them to be free of the heat treatment that was relatively common among sapphires from other deposits. By 1984, Intergem’s marketing campaign seemed to be working, with sales that year of over $3 million. But in 1985, Intergem was no longer able to make their payments to Sapphire International, which had become Roncor Inc., and in 1986 the property was once again under the ownership of Chikara Kunisaki (Voynick, 2001). In the late 1980s, consulting geologist and gemologist Delmer Brown had brought the Yogo sapphire deposit to the attention of AMAX Exploration Inc. president William Lodder (Voynick, 2001), who began a 22-month lease-purchase agreement with Roncor in March 1993. After nearly two years of mining and exploration, AMAX determined it was not cost effective to purchase the mine from Roncor for the approximately $10 million asking price, and retired from mining the Yogo dike in 1995 (Voynick, 2001). After Roncor took over the Yogo property again, Silver Standard Resources and an associated company named Pacific Sapphire Company Ltd. entered a lease deal with Roncor, but they were not successful. Their funds ran out and their lease option with Roncor expired in 2001 (Woodward and Hanley, 2013). On the heels of Intergem, Lanny Perry and Chuck Ridgeway, both of whom had worked for Sapphire International in the 1970s, were out prospecting when they discovered a new exposure of sapphire-bearing dike. By 1985 they went commercial with their mining claims and formed Vortex Mining with additional partners Pete Ecker and Paul Davis Jr. By 1987 Vortex Mining began underground operations, with a shaft that reached a depth of 280 feet (Woodward and Hanley, 2013). Although Roncor conducted some small-scale mining, even uncovering an 11 ct crystal in the summer of 1992 (Voynick, 1995), Vortex Mining operated the only active commercial mine in the late 1990s, producing 45,000 carats of cuttable rough per year (Voynick, 2001). Operations expanded, and a company called Small Mine Development (SMD) partnered with the Vortex mine, establishing a joint venture known as Yogo Creek Mining. SMD added a 3,000-foot spiral decline reaching 475 feet and installed a wash plant capable of processing 100 tons of ore per day (Woodward and Hanley, 2013). This wash plant was later removed after Yogo Creek Sapphire Mining closed its operations in November 2004, once mining became uneconomical (Laurs, 2005). By 2005, another deal was struck with Lanny Perry, who reacquired ownership of the Vortex mine. Perry had been acquainted with a miner named Mike Roberts while working in Alaska, and Roberts became interested in the Vortex property. He traded his Alaska gold mine to Perry in 2008 and set up Roberts Yogo Company (Kane and Hughes, 2012). Roberts successfully operated the mine until 2012, when he was killed in an accident at the Vortex mine (Nixon, 2016). The current chapter in Yogo’s long history brings in a longtime jeweler and friend of Mike Roberts’. Don Baide, owner of the Gem Gallery in Bozeman, Montana, bought the mine from Roberts’ wife in 2017 (Branstrator, 2017) and is operating as Yogo Mining LLC. Once the property is brought into compliance, mining operations can resume at the Vortex mine. Only time will tell what else is in store for the Yogo sapphire deposit. Around 350 million years ago (Ma), the part of Montana that would someday produce some of the world’s finest sapphires was a warm, shallow sea. Microscopic organisms lived and died in this primordial pool, and their remains filtered down and littered the ocean floor. Their inanimate husks accumulated and eventually solidified into limestone. This rock became the Mission Canyon Formation of the Mississippian-age Madison Group. This formation is around 275 meters thick in central Montana and forms many of the scenic features at Yogo Gulch. Around 50 Ma the warm, ancient seas in Montana had long since dried up and another geological act was set to begin. Far below the surface, something was stirring in the earth’s mantle, which had started to melt in places, producing magmas that rose to the surface and erupted in a fiery turmoil. This hadean activity produced numerous volcanic formations throughout Montana that form the Central Montana Alkalic Province. Among these volcanic formations, at a place that would come to be known as Yogo Gulch, was an unassuming dike that intruded into Mississippian-aged limestone and shales of the Madison Group in Judith Basin County, about 75 km southwest of the city of Lewiston. This is the geological story of how this small dike, in a remote location in central Montana, came to produce legendary blue sapphires. The Yogo dike was emplaced at 48.2 Ma (Gauthier, 1995) and occurs in multiple discrete segments for a total length of about 10 kilometers. These multiple segments suggest multiple intrusion events as well as possible later-stage faulting. The dike ranges from <1 meter to about 6 meters wide (figure 7). Sapphires occur in low concentration (0–70 ct/ton; Mychaluk, 1995) in the Yogo dike itself, where current mining efforts are focused. Descriptions of the dike’s geology here are based on the authors’ firsthand observations at the mine as well as previous studies (Brownlow and Komorowski, 1988; Dahy, 1988, 1991; Mychaluk, 1992, 1995; Gauthier, 1995). Figure 7. 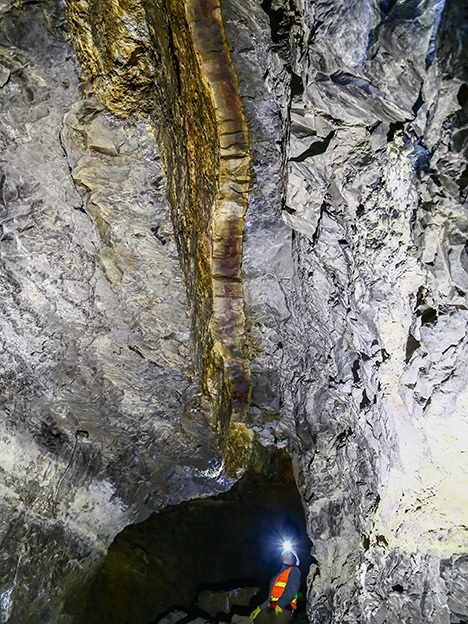 This underground image of the Yogo dike, as seen from the Vortex mine, shows it to be approximately 30 cm thick. Photo by Nathan Renfro. The dike rock is classified as a type of lamprophyre, a term that describes a group of ultrapotassic volcanic rocks composed primarily of large crystals of mica and/or amphibole. The Yogo lamprophyre is more properly called a ouachatite, a specific type of lamprophyre that is predominantly composed of phenocrysts (large crystals) of mica and clinopyroxene set within a groundmass of fine-grained mica and clinopyroxene with minor analcime, calcite, corundum, and other trace accessory minerals. Also occurring in the lamprophyre are light-colored globular structures sometimes called leucocratic ocelli, which range in size up to about 1 cm and consist of carbonates (calcite and dolomite) along with analcime and/or zeolite minerals. In addition to the leucocratic ocelli, lamprophyric magma will occasionally pick up foreign bits of rock along their ascent to the earth’s surface. These foreign rocks are called xenoliths (figure 8). While such xenoliths are rare, the most common ones in the Yogo dike are composed of plagioclase feldspar, clinopyroxene, and pyrope-almandine-grossular garnet. Importantly, Dahy (1988, 1991) reported the finding of a corundum-bearing plagioclase/clinopyroxene xenolith, which suggests that Yogo sapphires were derived from a similar source as garnet/clinopyroxene/feldspar xenoliths. Figure 8. This sample of lamprophyre from Yogo Gulch contains a small sapphire crystal about 4 mm in length and several leucocratic ocelli. Photo by Robison McMurtry; courtesy of Katie McPherson, Montana Yogo and Agate. In November 2017, two of the authors (NR and AP) had the opportunity to visit the Vortex mine, which had been recently purchased by Don Baide. Extensive underground workings in this portion of the Yogo dike were largely developed by Small Mine Development, LLC in 2000 (Woodward and Hanley, 2013) and were later worked by Mike Roberts when he owned Vortex. At the Vortex mine, the dike ranges up to about 12 inches (30 cm) in thickness. The rest of the dike, owned by the Roncor Corporation, is much wider. The contact with the country rock limestone is generally sharp, but the dike was seen to pinch and swell and cut off in many places, and occasionally it was clearly offset by later faulting. The Yogo dike is a fairly tough and competent rock, so the most profitable ore being pursued at the Vortex mine is the portion of the dike that has been altered and broken down to allow sapphires to be recovered more easily. This alteration may have occurred due to interaction of the magma with karstic groundwater during its intrusion into the Mission Canyon limestone. In many places the dike is completely unaltered and cohesive and appears dark gray to black. In other areas, the dike is so heavily altered that it is easily broken apart and appears orange, likely due to secondary production of iron (oxy)hydroxides. In these sections the dike rock has a clayey consistency, suggesting that the original minerals in the lamprophyre have been broken down by interaction with circulating fluids and largely turned into clay minerals. Genesis of Yogo Sapphires. One of the most prominent features of rough Yogo sapphires is the etched appearance of the crystal surfaces (figure 9). This has long been recognized as evidence that the sapphires were out of equilibrium with the lamprophyre that transported them to the surface. In other words, the sapphires are foreign crystals, or xenocrysts, and did not crystallize directly from the lamprophyre. This means, unfortunately, that the sapphires have been removed from the rocks in which they originally formed, and so geologists have mostly had to search for clues within the sapphires themselves to understand their formation conditions. Figure 9. The surfaces of rough Yogo sapphires often show an etched appearance, as seen here using differential interference contrast microscopy, suggesting they were not in equilibrium with the lamprophyre that transported them to the earth’s surface. Photomicrographs by Nathan Renfro (left and right) and Aaron Palke (center). Fields of view 0.95 mm (left), 0.48 mm (center), and 0.48 mm (right). Several hypotheses have been advanced to explain the genesis of Yogo sapphires. Meyer and Mitchell (1988), Mychaluk (1992), and Gauthier (1995) favored the hypothesis that the sapphires are xenocrysts that originated in Al-rich metamorphic rocks and were sampled by the lamprophyre as it made its way to the earth’s surface. Alternatively, Clabaugh (1952) suggested that the sapphires formed by metamorphism of Al-rich rocks by the hot lamprophyre as they were picked up and brought to the surface. While the sapphires have mostly been separated from their original host rocks, Dahy (1988, 1991) discovered a rare sapphire crystal in a plagioclase-pyroxene xenolith. This xenolith is similar to the garnet-plagioclase-pyroxene xenoliths studied by Gauthier (1995) and used for geothermobarometry measurements that indicated formation at 1.2–2.0 GPa (~40–70 km depth) and around 811–857°C. Cade and Groat (2006) found garnet inclusions in the sapphires to be consistent with group II mantle eclogites. However, the common occurrence of plagioclase feldspar inclusions in Yogo sapphires is inconsistent with an origin in mantle eclogites. Finally, Dahy (1991) suggested that Yogo sapphires formed through a peritectic melting reaction when the Yogo lamprophyre pooled at the base of the crust and partially melted Al-rich pelitic rocks. Figure 10. Leucocratic ocelli, shown in plane-polarized light (left) and cross-polarized light (right), are composed primarily of calcite near the core and analcime near the rim. Photomicrographs by Aaron Palke; field of view 2.88 mm. A recent study by Palke et al. 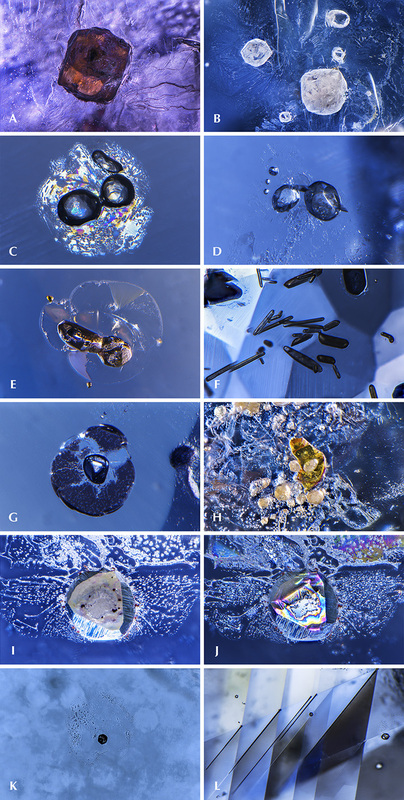 (2016) pointed out the similarity between the light-colored globular structures (“leucocratic ocelli”; figures 8 and 10) in the Yogo lamprophyre and the negative-crystal-shaped inclusions found in the Yogo sapphires (see “Inclusions” section below). Both are composed predominantly of analcime and calcite. Based on their analysis, Palke et al. (2016) proposed that Yogo sapphires crystallized when the lamprophyre intruded into the earth’s lower crust and partially melted a preexisting aluminum-rich rock there, forming corundum through a peritectic melting reaction. This is similar to the model of Dahy (1991), except that Palke et al. (2016) suggested the protolith was an anorthosite or troctolite rather than a pelitic rock. In this model, the analcime-calcite inclusions in the sapphires are actually considered to be carbonatite melt inclusions, and they are interpreted to have the same origin as the leucocratic ocelli in the lamprophyre. Both features are believed to have originally been a single carbonatite melt produced when the lamprophyre partially melted carbonated and hydrated lower crustal anorthosites, troctolites, or some other plagioclase feldspar-rich rock (Palke et al., 2016). In this model, the Yogo sapphires may not have crystallized directly from the magma that transported them to the surface, but the lamprophyre is directly responsible for their formation, as it served as a heat source for the partial melting event that led to the formation of these sapphires. The important distinction of this model is that while the Yogo sapphires can be considered xenocrysts in the lamprophyre, they were not accidentally incorporated since their genesis was intimately linked to the passage of the lamprophyre through the earth’s crust. One important aspect of this model is that, given the frequency of both silicate and carbonatite melt inclusions—in other words, inclusions of magma—Yogo sapphires can be considered igneous sapphires. As Palke et al. (2016) pointed out, this is at odds with their generally “metamorphic” trace-element signatures according to most of the commonly used corundum trace-element classification schemes. Other studies have also shown that such trace-element classification schemes often produce inconsistent results (e.g., Palke et al., 2017). It seems such classification should be used cautiously. For this study, a large number of rough and faceted Yogo sapphires from a variety of sources were examined. The largest rough sample weighed over 8 ct, while most weighed well under 1 ct. Numerous samples from the GIA Museum collection were used for trace-element chemistry measurements and UV fluorescence observation. Samples containing prominent inclusions were sourced from private collections. Also examined was a sample of Yogo sapphire in place in its host rock. Standard gemological instruments were used to measure refractive index, birefringence, specific gravity, pleochroism, and visible absorption spectra. A standard combination long-wave (365 nm) and short-wave (254 nm) ultraviolet lamp was used for fluorescence observations. Microscopic observation was performed using a Nikon Eclipse LV100 compound microscope with an observed magnification of up to 1000× and differential interference contrast capabilities, outfitted with a Nikon DS-Ri2 camera for recording images. Also used were a Nikon SMZ25 stereomicroscope equipped with dual fiber-optic illuminators, darkfield and brightfield illumination, polarizing filters, and a Nikon DS-Ri2 camera with an observed magnification of up to 157.5×. For spectroscopic measurements, we carefully selected a 4 mm Yogo sapphire that was free of inclusions and obvious color zoning. The sample was then fabricated into an optically oriented wafer with two polished sides oriented parallel to the optic axis. This sample preparation allowed polarized spectra measurements on both the ordinary and extraordinary rays (Thomas et al., 2014). Inclusions were identified using a Renishaw InVia Raman system with a 514 nm laser. Infrared absorption spectra were collected with a Thermo Nicolet 6700 FTIR spectrometer. Polarized UV-Vis-NIR absorption spectra were collected using a Perkin Elmer Lambda 950 spectrometer. Raman mapping of the 694 nm “R-line” was performed using a Thermo DXR2xi Raman imaging microscope with a 532 nm laser. Laser ablation–inductively coupled plasma–mass spectrometry (LA-ICP-MS) analyses were conducted on a Thermo Scientific iCap-Q ICP-MS with plasma RF power of 1400 W coupled with a New Wave Research UP-213 laser ablation unit with a frequency-quintupled Nd:YAG laser (213 nm wavelength with 4 ns pulse width). Laser conditions consisted of a 55 µm diameter spot size, a fluence of 10±1 J/cm2, and a 15 Hz repetition rate using internally developed corundum standards (Stone-Sundberg et al., 2017). Gemological Properties. In general, sapphires from geologically similar deposits show overlapping properties, often making it difficult to determine the precise geographic origin. For example, a sapphire from Madagascar and a sapphire from Kashmir, India, can have a similar appearance, physical properties, chemistry, and inclusions. There can be significant overlap in the gemological characteristics between Sri Lankan and Burmese sapphires, often making geographic origin determination of such stones difficult if not impossible. Yogo sapphires, however, are unlike any other. Their inclusions and trace-element chemistry are distinct enough that when either is consistent with known Yogo sapphire reference data, a given stone is almost certainly from the Yogo deposit. Yogo sapphires generally have light to dark blue colors and are generally flattened tabular crystals that yield small faceted stones. Violet to purple hues and color-change stones (blue to violet or purple) are occasionally encountered, but these account for less than 3% of production (see, e.g., figure 13) (Mychaluk, 1995). Most faceted Yogo sapphires are less than 1 ct, and faceted stones over 2 ct are extremely rare. Typical refractive index measurements for Yogo sapphires range between 1.760 and 1.771, with a birefringence of 0.008–0.009, and specific gravity averages 3.99–4.00. All of these properties are consistent with gem corundum from other sources. Inclusions/Microscopic Observations. For the gemologist, microscopic examination may be the most powerful tool to confirm that a sapphire is from the Yogo deposit. While sapphires from this deposit are generally eye clean, when inclusions are present, they are often diagnostic of this geographic origin. Unlike many other blue sapphires, Yogo sapphires are nearly always free of needle-like, oriented rutile inclusions known as “silk.” However, it is extremely rare (but not impossible) for a Yogo sapphire to exhibit small patches of rutile silk in the form of small acicular needles, flakes, and particles, which are often called “rutile dust” by gemologists. In the authors’ observations of hundreds of Yogo sapphires, only one was found to have silk, and only then in a very small amount (figure 11). This stone was reported to have been mined at the Vortex mine, and chemical analysis confirmed its origin. Figure 11. Silk is almost never encountered in Yogo sapphires but is a possibility, as this extremely rare example from the Vortex mine shows. Photomicrographs by Nathan Renfro, courtesy of James Rambur. Fields of view: 1.75 mm (left) and 1.26 mm (right). The most common types of inclusions are thin-film decrepitation halos, also referred to as “stress halos,” surrounding solid protogenetic inclusions of rutile, feldspar, apatite, garnet, metal sulfides, and rarely monazite (figure 12A–H). The protogenetic rutile crystals are often rounded and black to reddish orange in color. They can also occur as elongated lathe-like brownish green protogenetic crystals. Pyrope-almandine-grossular garnets are also distinctive inclusions, because of their unusual chemistry, that can be encountered in Yogo sapphires. They generally appear brownish orange and can range from quite pale to very saturated in color depending on their size. Other common inclusions are distinctive whitish negative crystals filled with a polycrystalline mixture of carbonate minerals and analcime (figure 12, I and J). Gübelin and Koivula (2008) were the first to report and identify these inclusions in Yogo sapphire. Figure 12. Protogenetic crystals of pyrope-almandine-grossular garnet vary in color from dark brownish orange (A) to light brown (B), depending on their size and resulting optical density. Rounded, protogenetic, transparent, colorless crystals in Yogo sapphires are often apa­tite (C) or feldspar (D). Rutile crystals can be seen as elongated rods with a dark brownish green color (E) and as black opaque rounded crystals with tension cracks and healed fringes that result from the igneous growth environment (F) and not from heat treatment. Other inclusions that may be encountered are iron sulfides, which often have a black opaque decrepitation halo (G), and rarely yellowish monazite (H). Negative crystals filled with analcime and calcite are shown in darkfield illumination (I) and reflected light displaying thin-film interference colors (J). Glassy melt inclusions with contraction bubbles are occasionally seen in Yogo sapphires (K), consistent with their igneous origin. Yogo sapphires are also occasionally twinned and contain intersection tubules (L). Photomicrographs by Nathan Renfro (A–J, L) and Aaron Palke (K). These features have been interpreted as originally trapped within the sapphires as blebs of carbonatite melt that later crystallized after entrapment into analcime and carbonate minerals. Glassy silicate melt inclusions (figure 12K) are also relatively common and an indicator of the igneous origin of Yogo sapphires (Palke et al., 2016). The observer may occasionally find pronounced lamellar twinning with intersection tubules (figure 12L). Many blue sapphires from other deposits around the world show some degree of color zoning when examined with diffuse transmitted light. Another defining characteristic of blue Yogo sapphires is their distinct lack of color zoning. Violet to purple Yogo sapphires, however, may show a minimal amount of color zoning (figure 13). Figure 13. The blue Yogo tablet on the left shows a uniform color, while the purple Yogo tablet on the right shows diffuse angular purple color zoning. Photo by Nathan Renfro (scale is in mm). When examined using long-wave UV light, blue Yogo sapphires typically show no reaction or a weak red fluorescence due to trace amounts of chromium, while violet to purple stones generally show a medium red fluorescence reaction due to higher levels of chromium (figure 14). Figure 14. This parcel of Yogo sapphires shows a wide variation in UV fluorescence. Purple to violet stones generally fluoresce stronger than blue stones. Photos by Nathan Renfro (scale is in mm). Spectra. Yogo sapphires have a typical UV-Vis-NIR spectrum with moderate to high iron and an absorption band at 580 nm, caused by the Fe2+-Ti4+ intervalence charge transfer, that is responsible for the blue color (Hughes et al., 2017) (figure 15). Figure 15. The polarized UV-Vis-NIR spectrum of a blue Yogo sapphire shows strong iron-related absorption at 377, 388, and 450 nm in both the ordinary (red trace) and extraordinary (blue trace) rays, while the cause of color results from the Fe2+-Ti4+ intervalence charge transfer band in the ordinary ray (red trace) at 580 nm. Note the absence of a strong absorption band around 870 nm, which typically indicates igneous origin for sapphires. The mid-infrared absorption spectrum offers a potentially diagnostic clue to Yogo origin. Yogo sapphires often, but not always, show a weak absorption peak at a wavenumber of approximately 3220 cm–1 (figure 16). In the authors’ experience, this feature may be present in sapphires from other Montana deposits (Rock Creek, Missouri River, and Dry Cottonwood Creek), but it is generally uncommon in sapphires from sources outside of Montana. This feature may serve as an important indicator of Montana origin and may be useful in identifying Yogo Gulch as the origin. Figure 16. Sapphires from Montana, including both Yogo and the secondary deposits at the Missouri River, Dry Cottonwood Creek, and Rock Creek, often show a unique absorption feature at approximately 3220 cm–1. While this feature is not exclusively diagnostic for Yogo sapphire, it is highly suggestive of a Montana origin. Chemistry. Yogo sapphires have a distinct trace-element signature that can provide an additional means of distinguishing them. LA-ICP-MS trace-element measurements indicated ranges of 73–146 ppma Mg, 77–131 ppma Ti, 3–19 ppma V, 3–470 ppma Cr, 1060–3110 ppma Fe, and 11–21 ppma Ga. These values generally overlap with the ranges reported by Peucat et al. (2007) and Palke et al. (2016), although our measurements indicate slightly lower average Mg values and slightly higher than average Ti and Fe. This difference is due to the use of internally developed corundum standards in this study, as opposed to the NIST glass standards used in most other studies (Stone-Sundberg et al., 2017). The ranges and averages of trace-element concentrations for Yogo sapphires are reported in table 1, which also contains trace-element concentrations for a variety of economic deposits. The full analytical results for each individual analysis can be found in supplementary table S1. Figure 17. Plot of Mg vs. Fe (in ppma) of Yogo sapphires compared to a select group of other economically important sapphires. This generally covers the range of sapphire trace-element chemistry. Yogo sapphires have a unique chemical signature that can be used in addition to inclusions to positively identify their origin. However, Yogo sapphires have a unique trace-element signature and in almost all cases can be easily distinguished using appropriate trace-element plots (figure 17). Specifically, Yogo sapphires can be separated by their generally higher concentrations of Mg and Ti. While some Sri Lankan sapphires analyzed here overlap with Yogo sapphires at their lower range of Mg and Ti concentrations, Yogo material always has much higher concentrations of Fe (figure 17). 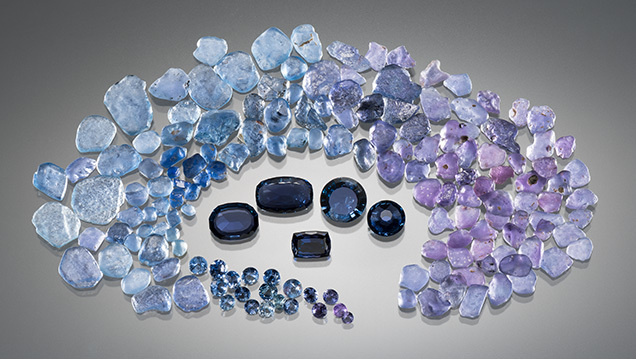 While this represents only a small sampling of sapphires from worldwide deposits, the unusual trace element signature of Yogo sapphires should allow clear identification by LA-ICP-MS measurements. In fact, the corundum locality that might have the most consistently similar trace-element chemistry is the Thai/Cambodian ruby mines. This is, of course, excepting chromium, which is consistently enriched in Thai/Cambodian rubies (although some Yogo sapphires do have similar levels of Cr). The similarities in trace-element chemistry, rough crystal morphology, and inclusions have led to speculation that Yogo sapphires and Thai/Cambodian rubies might have formed through very similar geological processes (Hughes et al., 2017; Palke et al., 2018). In addition to the subset of ordinary corundum trace elements reported in table 1, Co and Ni have also been found in Yogo sapphires (Z. Sun, pers. comm., 2017). Co and Ni were found in our samples from below the detection limit to 0.16 ppma and 0.81–16.3 ppma, respectively. Additionally, Emmett et al. (2017) performed a detailed colorimetric analysis of Yogo sapphires using highly accurate SIMS data. Those authors showed that Si is ubiquitously found in Yogo sapphires. Their study also showed that the Yogo sapphires’ rich cornflower blue color can only be explained by their incorporation of Si4+, which couples with much of the Mg2+ present, leaving enough Ti4+ to couple with Fe2+. This produces blue coloration due to the Fe2+-Ti4+ intervalence charge transfer. Raman Mapping. Even though one of the characteristic features of Yogo sapphires is a lack of blue color zoning, violet to purple stones may show visible color zoning due to an uneven distribution of chromium. The heterogeneous distribution of Cr was further explored in one of the blue samples from this study using photoluminescence mapping of the 694 R-line. The Raman imaging microscope was used to map the relative chromium distribution in the sample used to collect the UV-Vis-NIR spectrum. This sample was an oriented wafer with two windows polished parallel to each other and parallel to the optic axis (figure 18). Figure 18. Raman photoluminescence mapping produced this image, which shows the relative distribution of chromium in a Yogo sapphire viewed perpendicular to the c-axis. Chromium is concentrated in the outer portion of the crystal and is not particularly homogeneous throughout. Field of view approximately 4 mm. Figure 19. The flat tabular shape of the Yogo rough often dictates the production of stones under 1 ct in weight. Photo by Robison McMurtry. While Yogo sapphires (figure 19) may not be as well-known as those from other deposits such as Sri Lanka and Myanmar (formerly Burma), they are truly unique among gem corundum. They can be readily recognized by their inclusions and trace-element chemistry. Because they do not require heat treatment to improve their color, the origin alone offers the consumer reasonable confidence that their stone has not been heat treated or otherwise artificially altered. While the Yogo sapphire deposit has been known for more than a century, mining efforts have often been met with failure. And since the deposit is quite large, time will tell how much of an impact Yogo sapphires will have on the gem trade and jewelry design (figure 20) in the future. Figure 20. 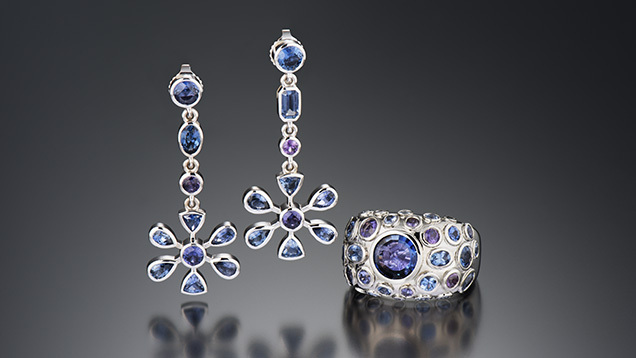 With activities resuming at Yogo Gulch, the industry may see more contemporary jewelry designs using the deposit’s sapphires. The suite shown here incorporates the blue material that made Yogo famous, along with the purple stones that remain a rarity. The center stone of the ring weighs 1.36 ct. Photo by Kevin Schumacher, courtesy of Bill Vance. Anorthosite: A rock composed dominantly of plagioclase feldspar (>90%). Analcime: A hydrated sodium aluminum silicate with the chemical formula NaAlSi2O6H2O. Carbonatite: A magma composed mostly of molten carbonate minerals. Clinopyroxene: A monoclinic chain silicate, the most common species of which is diopside (CaMgSi2O6). Decrepitation halo: A small fracture concentrically centered on an inclusion formed when the inclusion expanded against and fractured the host mineral, likely due to decompression or heating. Dike: A (sub)volcanic formation formed by the intrusion and solidification of magma into preexisting rock in a narrow, (sub)vertical sheet. Eclogite: A rock composed dominantly of pyrope-almandine garnet and Na-rich clinopyroxene. Eclogites are generally noted for their lack of plagioclase feldspar and typically form through metamorphism of mafic rocks at very high pressures, usually in the earth’s mantle or in very thick sections of the crust. Etching: Dissolution that occurs on the surface of a crystal when it is out of equilibrium and becomes soluble within its host rock. Intersection tubules: Hollow tubes formed in the corundum at the intersections of twinning planes. In corundum, these tubules often contain the aluminum hydroxide mineral boehmite. Lamprophyre: An ultrapotassic volcanic rock composed primarily of large crystals of mica and/or amphibole. Leucocratic ocelli: Light-colored globular structures often found in lamprophyres and other similar volcanic rocks. They are generally composed of calcite and analcime with traces of other minerals. Limestone: A sedimentary rock dominantly composed of calcium carbonate (CaCO3). Limestones generally form through the gradual accumulation of the skeletal remains of marine organisms onto the seafloor over time. Mantle: The layer of the earth below the crust from about 35 to 3,000 km deep. The mantle is compositionally distinct from the earth’s crust, with the mantle more Mg- and Fe-rich and Si-depleted and the crust enriched in Si, Na, and K.
Monazite: A light rare earth phosphate with the general formula (Ce,La,Nd)PO4. Negative crystal: A void with the morphology and crystallographic alignment of the host sapphire that can be filled with foreign included material. Solids, liquids, and gases may all be present in negative crystals. Pelitic rock: Rocks formed through the accumulation and solidification of mud or silt. Peritectic melting: A melting reaction in which one of the solid crystalline phases will break down into a liquid component and an entirely different crystalline phase. This is in contrast to “ordinary” melting reactions in which single crystalline phases melt directly into a liquid phase. Protogenetic: Referring to an inclusion whose formation significantly predates that of the host mineral. Rutile: Titanium oxide, TiO2. Notably, Yogo sapphires are nearly always free of needle-like, oriented rutile (“silk”). Shale: A sedimentary rock formed by the accumulation and solidification of mud. Shales are largely composed of clays, quartz, and other minerals. Troctolite: A rock composed predominantly of plagioclase feldspar, with lesser amounts of olivine and minor pyroxene. Xenocryst: A single crystal picked up by a magma during its ascent to the earth’s surface. Xenocrysts are generally out of equilibrium with the surrounding magma and show signs of corrosion or etching on their surfaces. Xenolith: A rock picked up by a magma during its ascent to the earth’s surface. Such rocks are foreign to the igneous rocks in which they are found. Xenoliths are useful to geologists trying to understand the composition of the deep earth. Mr. Renfro is manager of colored stones identification, and Dr. Palke is a senior research scientist, at GIA in Carlsbad, California. Dr. Berg is research geologist at the Montana Bureau of Mines and Geology at Montana Tech of the University of Montana in Butte. Samples containing prominent inclusions were sourced from the inclusion collection of John I. Koivula and from James Rambur, a gem cutter in Montana. Edward Boehm provided the Yogo sapphire necklace photographed in figure 1. A sample of Yogo sapphire in place in its host rock was sourced from Katie McPherson, who owns a small claim on the Yogo dike. Gem dealer and gemologist Bill Vance provided numerous samples of rough and cut stones for examination. Will Heierman from the Corunduminium website also provided many Yogo sapphires for trace element and inclusion analysis. The authors also are appreciative for the helpful comments and discussion from Don Baide, John Emmett, Richard Hughes, Robert Kane, and Ziyin Sun, which significantly improved the manuscript. Cade A., Groat L.A. (2006) Garnet inclusions in Yogo sapphires. G&G, Vol. 42, No. 3, p. 106. Clabaugh S.E. (1952) Corundum deposits of Montana. U.S. Geological Survey Bulletin 983 (https://pubs.er.usgs.gov/publication/b983). Dahy J.P. (1988) The geology and igneous rocks of the Yogo sapphire deposit and the surrounding area, Little Belt Mountains, Judith Basin County, Montana. Master’s thesis, Montana College of Mineral Science and Technology. ——— (1991) Geology and igneous rocks of the Yogo sapphire deposit, Little Belt Mountains, Montana. In D.W. Baker and R.B. Berg, Eds., Guidebook of the Central Montana Alkalic Province. Montana Bureau of Mines and Geology Special Publication 100, pp. 45–54. Gauthier G. (1995) Mineralogy, geochemistry, and geochronology of the Yogo dike sapphire deposit, Montana. Master’s thesis, University of British Columbia. Gübelin E.J., Koivula J.I. (2008) Photoatlas of Inclusions in Gemstones, Vol. 3. Opinio Publishers, Basel, Switzerland, pp. 228–229. Howard D.L. (1962a) No ghosts at Yogo! (part 1). Lapidary Journal, Vol. 16, No. 1, pp. 65–77. ——— (1962b) No ghosts at Yogo! (part 2). Lapidary Journal, Vol. 16, No. 2, pp. 228–241. Hughes R., Manorotkul W., Hughes B. (2017) Ruby and Sapphire: A Gemologist’s Guide. RWH Publishing/Lotus Publishing, Bangkok. Laurs B. (2005) Gem News International: Historic U.S. sapphire and benitoite mines close. G&G, Vol. 41, No. 3, p. 276. Leiper H. (1969) “Five miles of sapphires”: Famous Yogo Montana sapphire mine to be reopened. Lapidary Journal, Vol. 22, No. 10, pp. 1278–1286. Meyer H.O.A., Mitchell R.H. (1988) Sapphire-bearing ultramafic lamprophyre from Yogo, Montana: a ouachitite. Canadian Mineralogist, Vol. 26, pp. 81–88. Mychaluk K.A. (1992) Geology of the Vortex mine, Utica, Montana. Bachelor’s thesis, University of Calgary. Nixon L. (2016) All that glitters is not gold. Montana Magazine, No. 259, pp. 48–53. The $1 million sapphire campaign (1978) Jewelers’ Circular Keystone, Vol. 149, No. 10, p. 111. Palke A.C., Wong J., Verdel C., Avila J.N. (2018) A common origin for Thai/Cambodian rubies and blue and violet sapphires from Yogo Gulch, Montana, USA? American Mineralogist, in press. Voynick S.M. (1995) Yogo sapphires: A 1995 update. Rock and Gem, Vol. 25, pp. 50–81. ——— (2001) Yogo: The Great American Sapphire. Mountain Press Publishing Company, Missoula, MT. Woodward L.A., Hanley J.D. (2013) Yogo Sapphire Mine, Montana: History of a World-Class Gem Deposit. Running Wolf Press, Lewistown, MT. 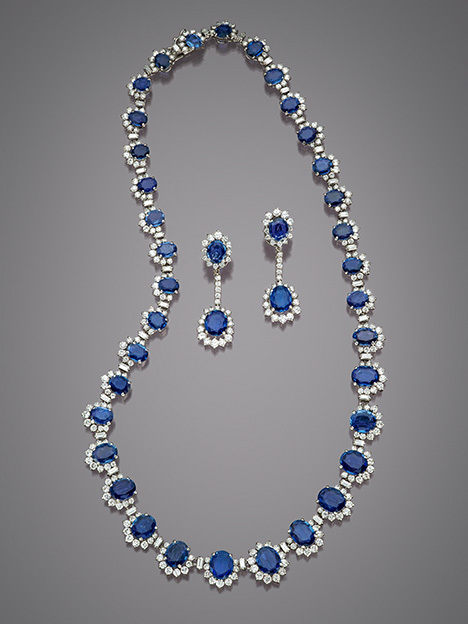 Yaras H. (1969) Precious Yogo sapphires will again gleam among the world’s precious jewels. Lapidary Journal, Vol. 23, No. 1, pp. 178–180. Considers the previously unreported but critical impact of silicon on the coloration of gem-quality sapphire.